Map of Cyprus with indication of the main archaeological sites in Cyprus. Click to see the enlargement. 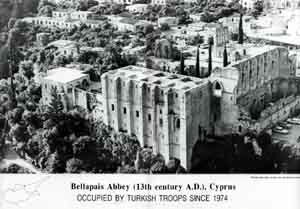 The picture on the left depicts Bellapais Abbey (derives from the French "abbey de la paix" which means the Peace Monastery) in the Turkish occupied village of Bellapais in Kyrenia district Cyprus. The initial building was constructed between 1198-1205. The main building as it can be seen today was built during the 13th century A.D. by the Francs (French) monks of St. Augustine order, and specifically during the rule of King Hugh III 1267-1284. The pavilions around the court yard and the refectory were constructed during the rule of King Hugh IV between 1324-1359. You can also see the Ancient Greek Orthodox Church of Mother Mary White Dressed. 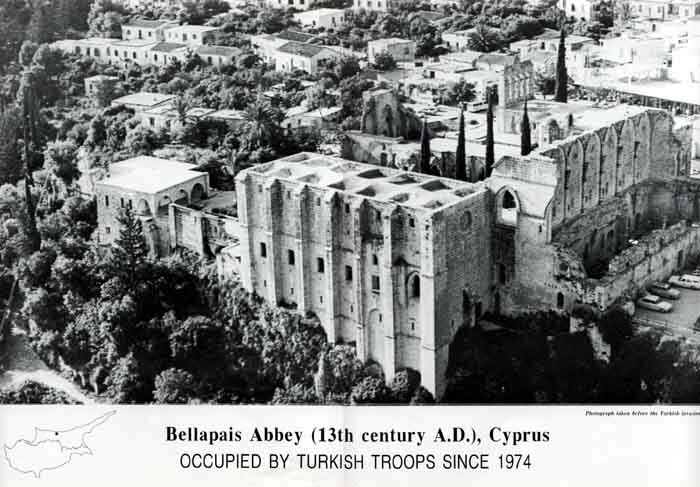 The Bellapais Abbey was used temporarily as a hospital for the wounded during the 1974 Turkish barbaric invasion after Kyrenia hospital was brutally bombarded by the Turkish air force and then captured. It was again evacuated and Bellapais fell in Turkish hands short after. For more information about occupied Bellapais Click HERE. The Greek Byzantine Castle of Kantara is situated in the eastern edge of Pentadactylos range, with two more castles western of it (Saint Hilarion, and Voufavento). 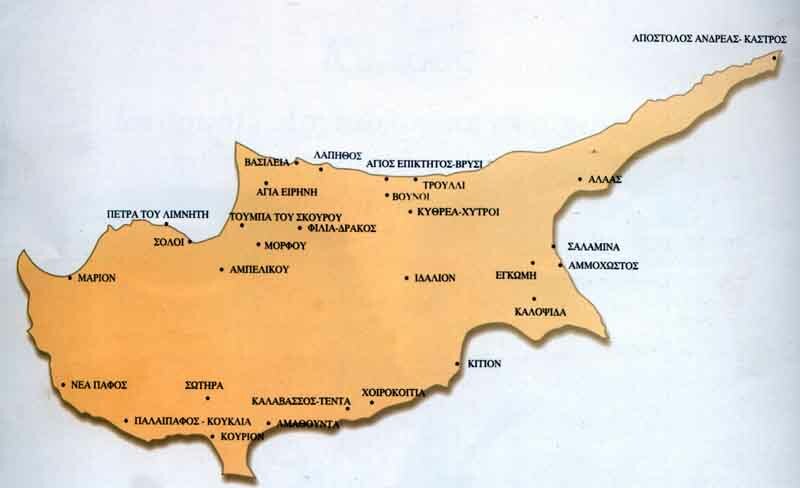 Built on an elevetion of 2068 feet it observes the entire northern shoreline of Cyprus, the Mesaoria area in the south, and controls the entrance of the Karpasia Peninsula. 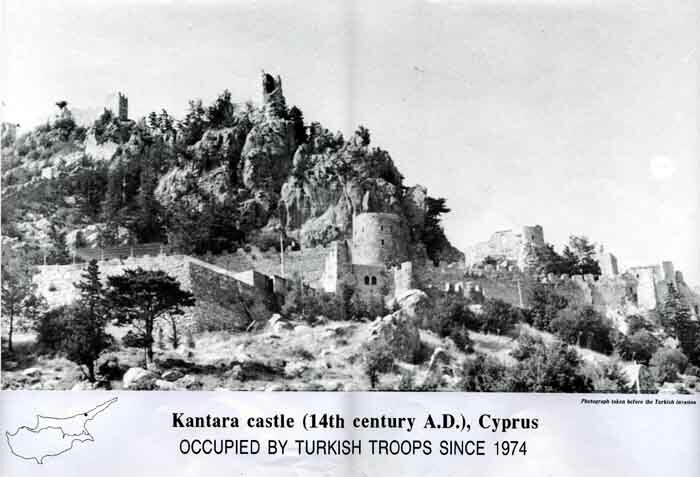 All three castles on Mount Pentadactylos (St. Hilarion, Voufavento, Kantara) were built by Byzantine Greeks, after the entire liberation of Cyprus from the Arab danger in 965 A.D. Nothing is known about Kantara castle until the conquer of Cyprus by Richard the Lionheart in 1191, where Isaac Komninos fleed in the Kantara Castle after his defeat by Richard Lionheart in Tremetoushia.For more information about Dhavlos village and Kantara castle Click HERE. 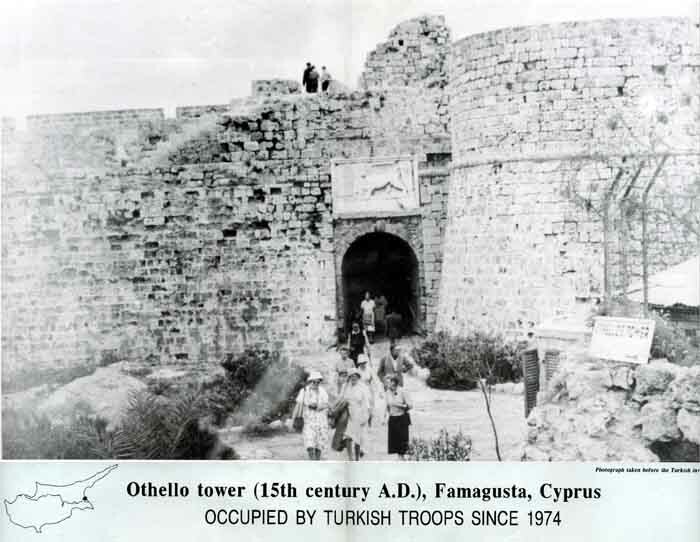 The Legendary Othello tower on the walls of Famagusta, Cyprus. According to Shakespeare, it is here that the tragic events of his play "Othello" took place, between Othello, general of the Venitian Army, and Desdemona, his wife that left her family and followed him in his adventurous journey in Cyprus. The Famagusta walls were built by the Venetians and Genoas (Italians) and during the Turkish attack in in 1570-1571 they were proved to be very effective in defending the town under the Command of the Italian governor Marco Antonio Bragadino, from the hordes of the barbarians for more than a year. Finally, and after a whole year of siege, the town fell into the hands of the barbarian Turks and marked the presence of Turks on the island, in 1571. 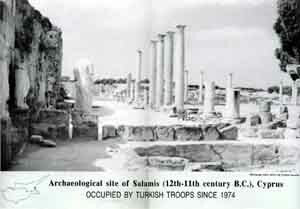 The ancient town of Salamis 12-11 centuries B.C. Salamis was built by the Greek Trojan hero Tefkros, brother of Ajax. Tefkros and Ajax both fought in Troy having under their command 12 ships. Ajax, probably the mightiest of the Greeks after Achilles, committed suicide after he was denied the arms of dead Achilles, which were given to Odysseus. When Tefkros returned back to Salamis island Greece, his father Telamonas, held him responsible for the death of Ajax and for not taking revenge for Ajax death, and exiled him to Cyprus. Tefkros built the Salamis of Cyprus, with an ancient Greek gymnasium, ancient Greek theater, Greek Agora, temples, Acropolis, etc. in memory of his home land in Salamis Greece. Salamis has been under illegal Turkish military occupation since 1974. The castle of St. Hilarion on Mount Pentadactylos in Kyrenia district Cyprus. St. Hilarion Castle was built during the 11th century. In his walls are included a church, stone water tanks, observation posts, storage rooms, and resting and recreation grounds. 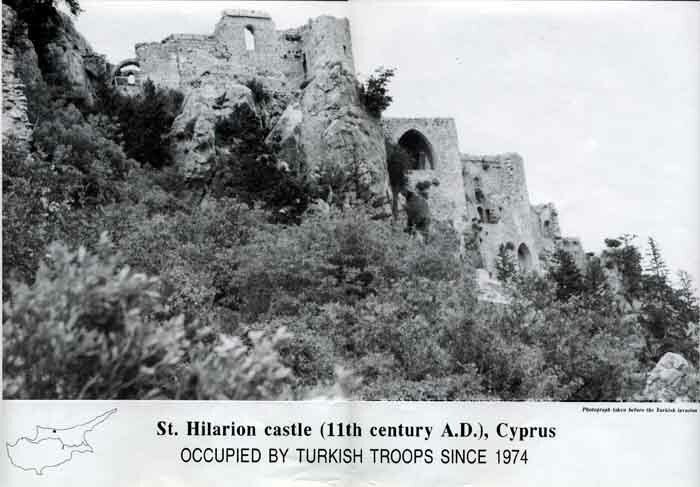 During the Louzinian era, St. Hilarion Castle was turned into summer palace. During the Turkish up rise in 1964 it was captured by Turkish militants. Since 1974 it has been under illegal Turkish occupation. On the entrance of the castle the Turks have placed a statue of Mustafa Kemal, founder of their republic, to prove once more that their military presence in Cyprus serves only the strategic interests of the Turkish militants, and non else.